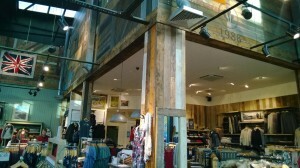 Fat Face Clothing have taken a unit at the new Whitely Village shopping centre in Hampshire. This Whitely Village redevelopment has recently opened to wide acclaim from the retail industry on the overall design and look of the retail complex. Hampshire Mezzanine Floors designed a high specification mezzanine floor to ensure the very high roof space within the unit was utilised effectively and the mezzanine was provided to accommodate back of house activities including storage area, restroom, office and training areas to ensure as much of the precious ground floor space could be utilised for front of house retail usage. Part of the mezzanine forms a high level display frontage accessed from the mezzanine floor with glazed balustrading that Hampshire Mezzanine provided to the perimeter. 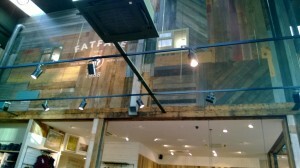 This enables Fat Face to merchandise this display and change the clothes per season safely whilst achieving a high level display. Access to the mezzanine floor was provided by a twin flight Part M staircase with mid-landing. This service access staircase had non-slip durbar plate treads with closed steel risers and high visibility nosings. Also grab rails were specified to the base and head of the stairs to ensure full DDA compliance was achieved. The mezzanine floor had a secondary lower level constructed by HMF which was designed to enable the mechanical plant to be accessed for maintenance and future modifications without any disruption to the retail sales floor below. This lower platform is accessed from the higher level mezzanine via a cat ladder with safety hoops. The complete mezzanine structure was one hour fire resisting and Hampshire Mezzanine provided one hour steel column casings to protect the mezzanine floor columns. 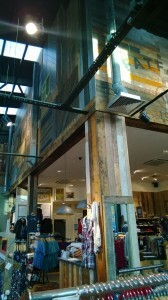 The store has been beautifully fitted out by Fat Face and looks aesthetically pleasing. The project was completed on budget and ahead of programme.